KFH Series Strain Gauges has replaced the KFG series, use link below. 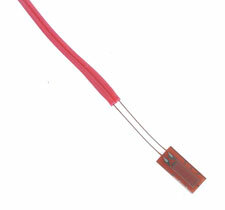 The KFG SERIES pre-wired strain gauges are superceeded by the KFH SERIES. Please see the KFH Series for complete details, or contact our Sales department for more information..
Nota: Pre-wired strain gauges are provided with a calibration cetificate showing the strain factor for the gauges in the package. Sold in packages of 10 strain gauges.